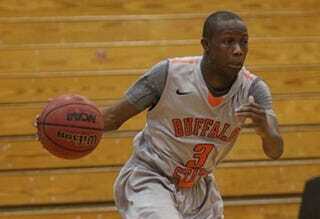 Bradley Doyley spent two-and-a-half years on Buffalo State College’s basketball team. A published report released Tuesday, citing unnamed police sources, says that there is no evidence of hazing in the death last week of a student at Buffalo State College in New York, according to the Buffalo News. The sources, at the Buffalo Police Department, cited preliminary autopsy findings. The lawyer for the young man’s family, however, dismisses the report outright, Buffalo NPR station WBFO reports. Bradley Doyley, 21, died Thursday night at Buffalo General Medical Center. Initially, authorities did not disclose the cause of death, but the Buffalo News reported that he had been hospitalized after falling ill in January while trying to join Alpha Phi Alpha fraternity. He might have consumed hazardous liquids as part of a hazing event, according to that earlier report by the newspaper. Buffalo State suspended the campus chapter of the fraternity, and the national fraternity suspended the local chapter the day after Doyley’s death. Family and friends said that Doyley had been made to drink a toxic substance and had been sick and throwing up blood for several weeks. Attorney John Elmore, who is representing Doyley’s family, told WBFO late Tuesday morning that he met with homicide detectives who are investigating the case. “They told me they don’t have a clue who these unnamed sources are,” Elmore said. Elmore also reportedly told WBFO that he has given the police relevant evidence and that the investigation is just beginning. Doyley was a business major from Brooklyn, N.Y., and set to graduate this spring. He played for two-and-a-half seasons on the men’s basketball team and was active in the Caribbean Student Organization on campus. Reportedly, Elmore and his law office are exploring civil action on behalf of the family after the criminal case concludes.